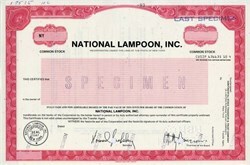 Beautiful specimen certificate from the National Lampoon, Inc.. This historic document was printed in 1983 by the American Bank Note Company and has an ornate border around it with a vignette of the company name. This item has the printed signatures of the Company's President, Matty Simmons and Secretary. National Lampoon, Inc was incorporated in 1967. National Lampoon, Inc was primarily engaged in publishing National Lampoon Magazine. Its other activities included radio, stage shows and the development and production of motion pictures. National Lampoon Although Britain has enjoyed a long tradition of looking to its colleges for humor, the crossover from collegiate to professional humorist in America has for the most part been much less conspicuous. A notable exception, however, was a group of students at Harvard in the late 1960s who went on in 1970 to found the National Lampoon, which enjoyed two decades of circulation before effectively ceasing publication in April of 1992. It is quite possible that the National Lampoon might never have come into existence but for the astonishing success of some undergraduate collaborations by Henry Beard and Douglas Kenney while they were on the staff of the venerable Harvard Lampoon, the college's century-old humor magazine: parodies of Time and Life, which went into national distribution and sold well, followed by a J. R. R. Tolkien spoof, Bored of the Rings, which ran to numerous printings after its publication by Signet in 1969. After graduation Beard and Kenney found a backer for their proposal for a national humor magazine in Matty Simmons, fresh from 17 years as executive vice president of the pioneering credit card company Diner's Club and eager to find new areas of investment. In 1967 Simmons had created a company called 21st Century Communications which later became National Lampoon, Inc., with Simmons as its chairman of the board and Leonard Mogel, from Simmons' Weight Watchers Magazine, as its publisher. Beard was installed in the magazine's midtown Manhattan office as executive editor, Kenney as editor-in-chief, and Robert Hoffman as managing editor. The art department was run by Peter Bramley, a cartoonist fresh from Massachusetts College of Art, who had moved to Manhattan from Boston in the late 1960s, and Bill Skurski, Bramley's partner in Cloud Studio, which was located in a storefront on Manhattan's Lower East Side. Collaborating with them was photographer Mike Sullivan, an emigrant to Manhattan from Montana's cattle country, who set up and shot the pictures for Cloud Studio's photo-novellas. Matty Simmons is an American film and television producer, former newspaper reporter for the New York World-Telegram and Sun, and former Executive Vice President of Diner's Club, the first credit card company. Simmons gained his greatest fame while serving as the chief executive officer of Twenty First Century Communications. Founded in 1967 by Simmons and fellow Diner's Club refugee Len Mogel, Twenty First Century was created to publish a "counterculture" magazine called Cheetah. While Cheetah failed, the partners had more success in the 1970s with Weight Watchers and National Lampoon magazines. Under Simmons' direction, National Lampoon's entire editorial staff was fired and replaced with his children (Michael Simmons and Andy Simmons), as well as Peter Kleinman and Larry Sloman. The magazine expanded into radio, theater, records and film. Simmons's film credits include acting as the producer of National Lampoon's Animal House and the National Lampoon's Vacation film series. He has written seven books. His most recent, Fat, Drunk, and Stupid: The Making of Animal House, was published by St. Martins Press in 2012.